Pants and belt, and shirt and tie. For this one, you could dress up an actual teddy bear and change the articles of clothing to fit what you have, or you can make it as a flannel board. Pattern available from The Flannel Board Storytelling Book by Judy Sierra. Teddy wore his red shirt all day long. Teddy wore his blue pants…. Teddy wore his green socks…. Teddy wore his yellow hat…..
Teddy wore his black shoes….. The longer you wear them the stronger they get! 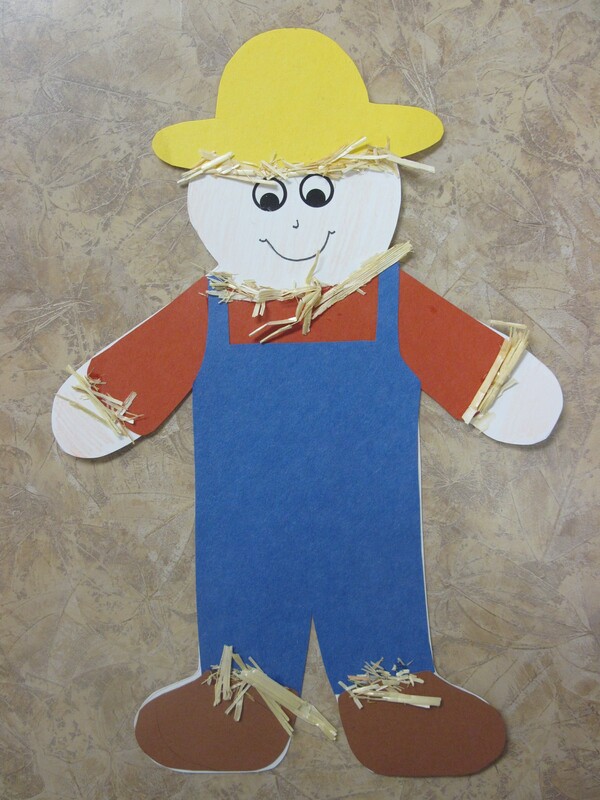 CRAFT: Dress a paper scarecrow in his hat, shoes, shirt and overalls. Glue on some pieces of straw and you’ve got a wonderful fall decoration! Templates available here: Scarecrow body and Scarecrow clothes. For a non-fall theme, leave out the straw and use him as a boy or a farmer; give the body ears and he becomes a teddy bear; or use the body as a gingerbread man template.